Tunisians are extremely disappointed with conditions in their country and their economy. A broad majority (81%) says the nation is headed in the wrong direction. Just 13% think things are going well, down slightly from the 20% who felt that way in 2012. 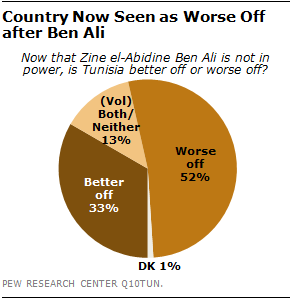 Roughly half (52%) say Tunisia is worse off now that Zine el-Abidine Ben Ali, the former president who resigned his post in 2011 amid mass protests, is not in power. Only a third thinks things are better. This is a significant shift from last year, when the public was divided, with 42% who said Tunisia was worse off and 45% who said the country was better off. Nearly nine-in-ten Tunisians (88%) say the economic situation in their country is bad, including 53% who say it is very bad. Economic despair has deepened since 2012, when 40% said conditions were very bad. Half of Tunisians say the economy will improve in the coming year; however, optimism has declined by 25 percentage points since last year. About two-in-ten think things will stay the same over the next 12 months. And, a quarter believe economic conditions will get worse – an increase in pessimism of 13 points since 2012. Tunisians are also much more likely to say they are personally suffering today. Nearly six-in-ten (57%) report that their personal finances are doing poorly, an increase of 14 percentage points since the previous survey. A minority (42%) now says things are going well at home, compared with 56% in 2012. 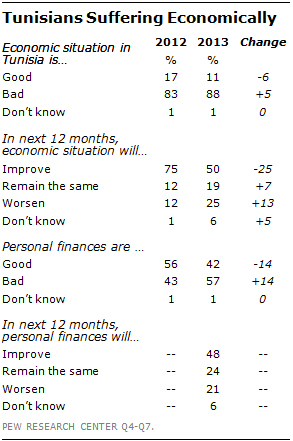 About half of Tunisians (48%) are optimistic that their personal finances will improve in the next year. Roughly a quarter (24%) believe things will stay the same and 21% think things will worsen. Older people in particular are disappointed with their personal finances today and skeptical that they will improve tomorrow. Fewer than four-in-ten Tunisians age 50 or older (36%) say their personal economic situation is good, compared with 48% of those 18-29 years old. Similarly, a minority of older Tunisians (42%) think their personal finances will improve in the next 12 months while a majority of young people (55%) are optimistic. 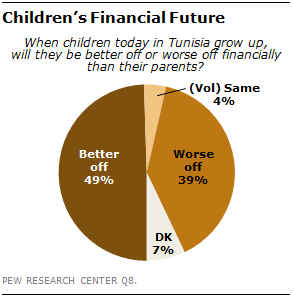 Despite the overall dismal economic picture, roughly half of Tunisians (49%) believe that when young people in their country grow up, they will be better off financially than their parents. About four-in-ten (39%) say they will be worse off. Those who report that their personal finances are doing well today are much more optimistic about the future for Tunisia’s youth than those who are struggling (59% better off vs. 43%).